translate the information on this page for you. Call Yolanda Murillo @ 806.894.6858 for assistance. traducira la informacion en esta pagina. Llame a Yolanda Murillo al 806.894.6858 para asistencia. 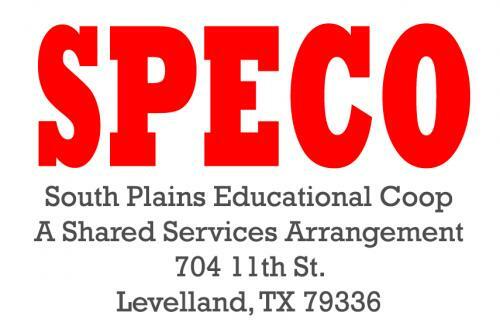 South Plains Educational Coop is a shared services arrangement with nine school districts: Anton, Levelland, Meadow, Morton, Ropes, Smyer, Sundown, Whiteface, and Whitharral. SPECO makes available to all students with disabilities a free and appropriate public education which includes special education and related services to meet the unique needs of each student. The Federal regulations and State Board of Education rules assure that this education to students with disabilities will be provided in the least restrictive environment, and the South Plains Educational Coop abides by the Federal and State guidelines. The support staff includes educational diagnosticians, instructional supervisors, counselors, Licensed Specialists in School Psychology, an occupational therapist, physical therapists, speech pathologists, a behavior specialist, a teacher of the visually impaired, and an adaptive physical education teacher. The program is funded by Federal funds (IDEA-B), local funds, and revenue from the nine districts participating in the SSA/Coop. Child Find is a federally established comprehensive system designed to ensure that each child, regardless of disability, is educated toward his or her maximum potential. The purpose of Child Find is to locate, identify, and evaluate infants, children, and young adults through age twenty-one who may have a developmental delay or other disabilities. The Districts in the South Plains Educational Coop SSA offer comprehensive special education services to eligible students ages three through twenty-one years and to children from birth through twenty-one years who have a hearing or visual impairment. Children from birth to age three with other disabilities will be referred to appropriate agencies for services. All referrals are considered confidential and services are provided at no cost. A free appropriate public education with a full continuum of services is available. A project of the Texas Education Agency committed to providing accurate and consistent information to parents and families of students with disabilities. Defines individual disabilities, offers tips for parents and teachers, and provides links to other important resources and disability organizations. Provides detailed information and resources regarding the transition and graduation process for students with disabilities.